I was wondering why dogs shouldn't eat chocolate. Can't dogs just excrete the indigestible component in their droppings? It's common knowledge that dogs shouldn't eat chocolate. What I don't know is why chocolate would kill them, from a specifically biological perspective. The reason is simple: Chocolate contains cocoa which contains Theobromine. The darker the chocolate is (meaning the more cocoa it contains) the more theobromine it contains. This is a bitter alkaloid which is toxic to dogs (and also cats), but can be tolerated by humans. The reason for this is the much slower metabolization of theobromine in the animals (there are reports for poisonings of dogs, cats, birds, rabbits and even bear cubs) so that the toxic effect can happen. Depending on the size of the dog, something between 50 and 400g of milk chocolate can be fatal. As mentioned by @anongoodnurse the cocoa content in milk chocolate is the lowest and much higher the darker the chocolate gets. First it is an unselective antagonist of the adenosine receptor, which is a subclass of G-protein coupled receptors on the cell surface which usually bind adenosine as a ligand. This influences cellular signalling. Then it is a competitive nonselective phosphodiesterase inhibitor, which prevents the breakdown of cyclic AMP in the cell. cAMP is an important second messenger in the cell playing an important role in the mediation of signals from the outside of the cells via receptors to a reaction of a cell to changing conditions. The levels of cAMP are tightly controlled and the half-life of the molecule is generally short. Elevated levels lead to an activation of the protein kinase A , an inhibition TNF-alpha and leukotriene synthesis and reduces inflammation and innate immunity. For references see here. The LD50 also differs between different breeds of dogs, so there are online calculators available to make an estimation, if there is a problem or not. You can find them for example here and here. The selective toxicity makes it even an interesting poison for pest control of coyotes, see reference 4 for some details. Evaluation of cocoa- and coffee-derived methylxanthines as toxicants for the control of pest coyotes. The toxic ingredient in chocolate is in the mythylxanine class, a substance called theobromine. It is much like theophylline; overdoses of theophylline used to be very common before the advent of inhalers for the treatment of asthma. (Chocolate also has some caffeine in it, which may exacerbate the effects of theobromine.) As @Chris stated, it is only slowly metabolized in dogs. 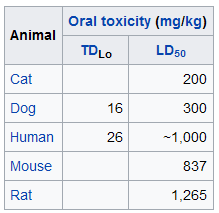 Generally, toxicity depends on the size, age, the breed of the dog, any medical problems the dog may already have, as well as what type of chocolate was consumed. The larger the dog (given no other predisposing factors), the more theobromine they can handle, and older dogs tend to have more problems than younger ones. 20 mg/kg (or 20 mg/2.2 pounds, or about 10 mg/pound) may cause agitation, hyperactivity and gastrointestinal signs such as drooling, vomiting, and diarrhea. At >40 mg/kg, cardiac signs can be seen, and include a racing heart rate, high blood pressure, or even heart arrhythmias. At >60 mg/kg, neurologic signs can be seen, including tremors, twitching, and even seizures. Fatalities have been seen at around 200 mg/kg (~ 100 mg/lb), or when complications occur. So, theoretically a 40 pound dog (medium-sized dog? My Border Collies each weigh 42 pounds, and are considered medium-sized) will not die if it eats a Giant Hershey's Symphony Bar (a very yummy 6.8 oz / 204g) because that's less than 10 mg/pound. I've never put this to the test, however, and would not recommend it. I had a chocolate loving dog. She was 12 lbs. The vet said she could have it, provided she wasn't given too much. So his rule of thumb was not to feed her more than I would allow the average 2 year old in 24 hours. Which is two pips ( or two pieces from Hershey's bar). She lived to 16 yo. So yes, chocolate is a hazard to dogs, but like all things done in moderation it should be fine. Check with your vet. Chocolate contains substances known as methylxanthines (specifically caffeine and theobromine), which dogs are far more sensitive to than people. Different types of chocolate contain varying amounts of methylxanthines. In general, though, the darker and more bitter the chocolate the greater the danger....For instance, 8 ounces (a ½ pound) of milk chocolate may sicken a 50-pound dog, whereas a dog of the same size can be poisoned by as little as 1 ounce of Baker's chocolate! Not the answer you're looking for? Browse other questions tagged zoology food toxicology dogs or ask your own question. Why do animal teeth get darker if exposed? Can Squirrels Eat Every Mushroom?